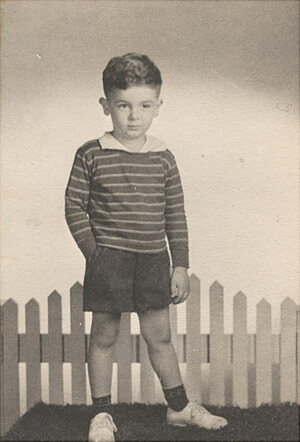 I was all of 6 years old in 1948. Our family had recently moved from Brooklyn, N.Y. to our new home on Long Island, where I shared a bedroom with my kid brother. Television was still very new in those days and my Dad was under the impression that we really didn’t need one, as it was obviously a passing fad. Dad wasn't big on investing in 'passing fads.' The only one on our entire block to have a TV set was a friend of mine and occasionally we’d sit in front of that huge Dumont set, with it’s tiny 8" flickering black and white screen, finding that there wasn’t much on that interested us anyway. Every winter, like clockwork, I’d catch a minor cold or flu, which meant a day in bed, bowls of Mom's chicken soup and listening to the radio. I loved to listen to Arthur Godfrey and the soap operas during the day and the comedy shows at night. And then there were the "Snow Days", as anyone whose grown up in a climate like New York’s will tell you there was nothing greater. We’d awaken and make a mad dash to the radio to listen to the school closure reports. And when the name of our school WAS mentioned, it was like winning the lottery! Ahead of us was a day of indoor games and those wonderful radio shows. I can almost close my eyes and hear them now. My favourites were Fibber McGee and Molly, Sgt Preston of the Yukon, Burns and Allen, The Great Gildersleeve, Mr. Keen, Tracer of Lost Persons, The FBI In Peace and War, Jack Benny, Arthur Godfrey Show and Tex and Jinks (who broadcasted from New York’s Waldorf Astoria Hotel, and who were always drinking Sanka Coffee). Tex and Jinks made such small talk that I’m sure they even bored themselves, but somehow I loved listening to them. They were a big part of my world, as were ALL the radio stars. We were always taking drives to New England in my Dad’s Buick and, in spite of the snow tires, at least once or twice every winter we’d inevitably get stuck in the snow for hours. Mom and Dad were in the front seat and my brother and I laid down in the back seat, bundled up and as we waited for the AAA to come and dig us out, we listening to the radio as the blizzard howled around us. It’s funny but it seemed like every time we got stuck in the snow, Jack Benny was on the radio, which made us all laugh hysterically, in spite of our precarious situation. The radio was there to help me celebrate any number of milestones in my life. I recall one birthday getting a crystal radio set, which once I put it together and strung what must have been fifty or so yards of antenna wire around our back yard, enabled me to listen to a few stations without any electricity or batteries. Oh, how many nights I’d fall asleep listening to shows on its single earphone… and Mom and Dad never knew. And then, the best birthday present of all, I was given my own portable Zenith transistor radio. It was almost too big to carry around, and ran on at least 10 ‘D’ batteries… but now I had the ability to listen to my shows anywhere! Through good days and bad, sickness and health, through crystal sets or huge, so- called, "portables", the radio was always there, and not in the background either, as folks use it for today… oh no. Radio was the centerpiece of our entertainment world, and somehow, possibly because there were no pictures and you had to concentrate on every word, those dramas, comedies and variety shows became a big part of our lives and who we were. "Hey, did ya hear what Fred Allen said about Jack Benny last night? I can’t wait to hear what Jack has to say about that!" "What about that Arthur Godfrey Show… all the way from Hawaii… unreal!" "Sorry, I gotta run… Superman’s on in 5 minutes." We’ll never hear words like these again. And yet as I listen to these old radio shows today, often with a tear in my eye, wonderful memories come flooding back, making me feel that ‘the theatre of the mind’ lives on forever. Be the first to comment on "Old Time Radio Memory: Harold Ellison: Remembering New York 1940-50's Radio..."